White Noise Market app: insight & download. The White Noise Market native app is the best way to download FREE sounds to White Noise, White Noise Pro, White Noise Lite, and White Noise Baby. Upload your existing White Noise recordings and mixes to share your audio experiences with the entire White Noise community. Join us in helping others relax during the day and sleep great at night! Discover thousands of White Noise Market sounds and download them into White Noise for free. Browse by featured sounds, recent sounds, or by sound category. Check out the latest chatter to see what sound everyone is talking about. Upload your own audio recordings from your unique part of the world. Navigate the world map to find unique sounds or search by keyword to find the perfect sound. Leave comments and start a conversation about the sounds you enjoy the most. Sounds will be quickly downloaded in the background and made available to all of our White Noise apps including White Noise, White Noise Lite, White Noise Pro, and White Noise Baby. New sounds are posted daily so check back often and enable notifications to be the first to download our weekly featured sounds. - Upload recordings and mixes to share your audio experience with the entire community. - Discover thousands of sounds users are talking about with the Chatter view. - Push notifications when weekly featured sounds are available for download or users respond to your comments. - Today widget can be enabled to show you the 3 most recent featured sounds. 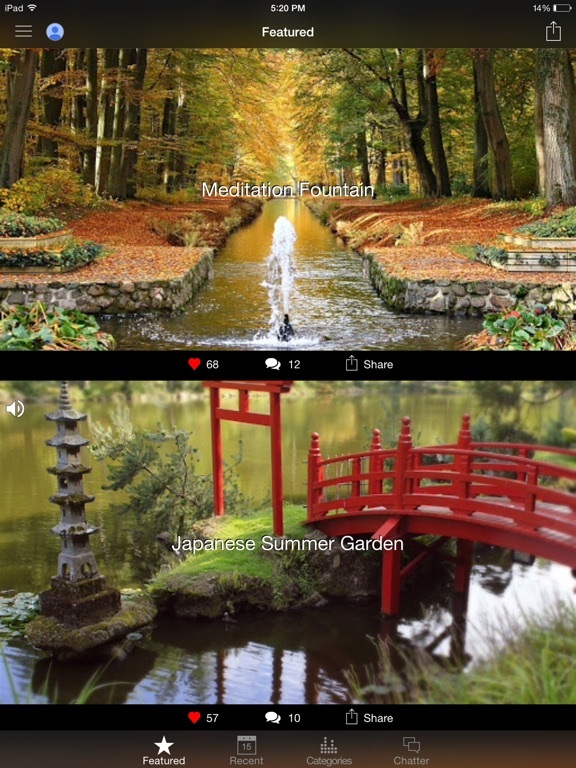 - Explore specific sound categories such as ASMR, Binaural Beats, Nature, Music, Meditation, and more! 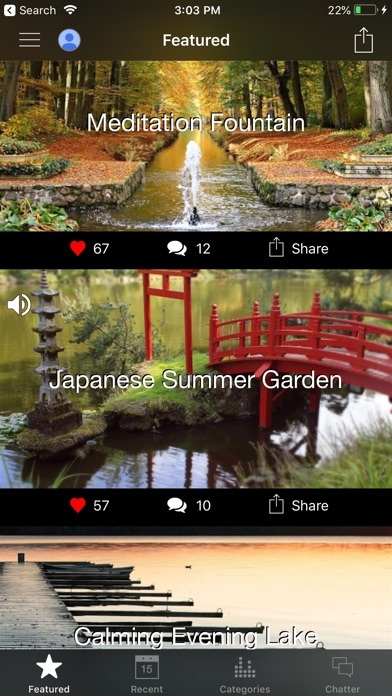 - Discover unique sounds from around the world by navigating the world map of recordings. - Make friends by starting a conversation with other White Noise users. Heart and post comments about your favorite sounds and mixes. - Preview sounds before you download and share your favorites. - Stream or purchase sounds at popular digital stores including iTunes and Apple Music. - Supports Portrait/Landscape orientations and Retina resolutions for all versions of iPhone and iPad. Box Fan, Rain Storm, Tent Rain, Waterfall, Windy Pines, River Rapids, Marina Dock, Rock Beach, Ocean Waves, Bamboo Wind Chimes, Blizzard, Passenger Train, Summer Cicadas, Rain on Tin Roof, Lawn Mower, and many more added every week. Login with your email or favorite social network to download unlimited sounds, upload your recordings, send hearts, and post comments. Guest login is also supported but limited to only a few downloads per day. * Subscriber Badge - Show others you are supporting development of the Market with a trendy gold badge. * Double Zen - Earn Zen at twice the rate! * Unlimited Uploads - Record & Upload without limits. * Priority Review - Your uploads will be reviewed before anyone else. * No Ads - Save your network. Listen to more sounds. Market Premium is an optional subscription available monthly or yearly from date of purchase. Payment will be charged to your Apple ID account at confirmation of purchase. Subscriptions automatically renew at the chosen monthly or yearly rate unless canceled 24 hours before the end of the current period. Your Apple ID account will be charged for renewal within 24 hours prior to the end of the current period unless canceled. You can manage your subscription, cancel anytime, or turn off automatic renewal from your App Store account settings. Thanks for being a part of the White Noise community! 25 January 2015 : Free!